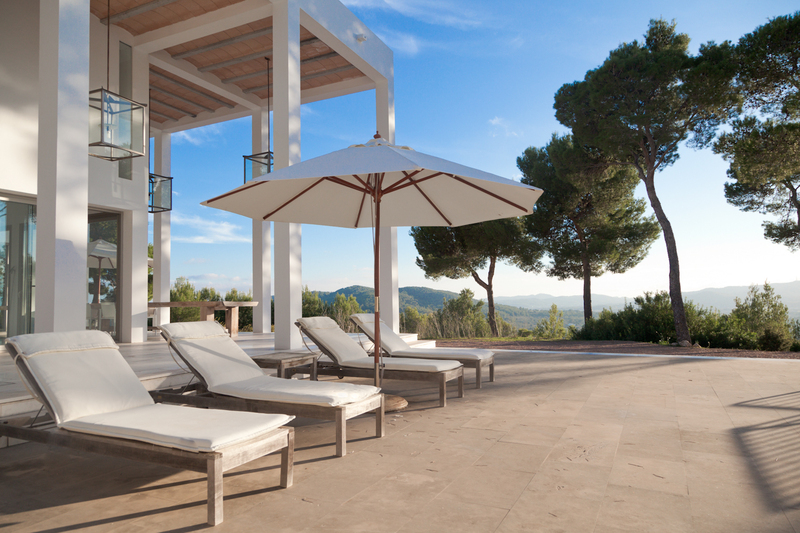 A luxury Ibiza villa, Villa Leoni Arriba is nestled into the Morna Valley countryside in the heart of Ibiza. 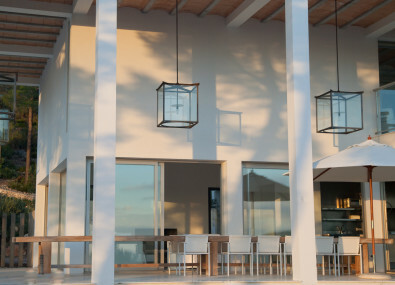 Accessed by a paved road, conveniently off the main tarmac road that connects San Carlos with the San Lorenzo/San Juan road. 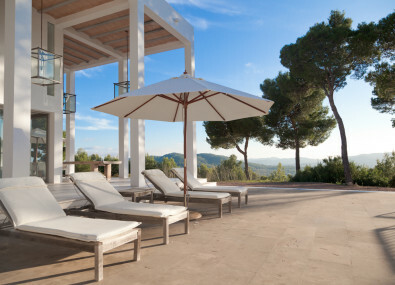 Due to the hillside location, the villa has amazing panoramic views to the sea on the east coast. 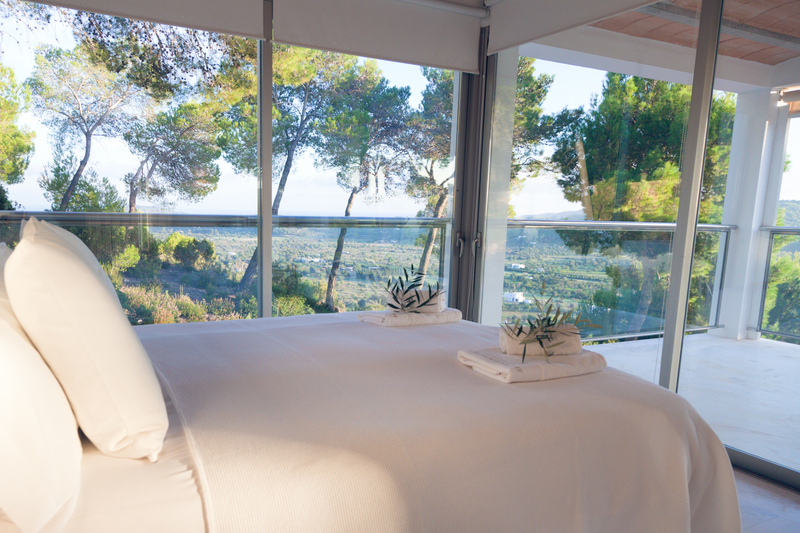 In particular, the views at sunrise are spectacular from the master bedroom suite upstairs. 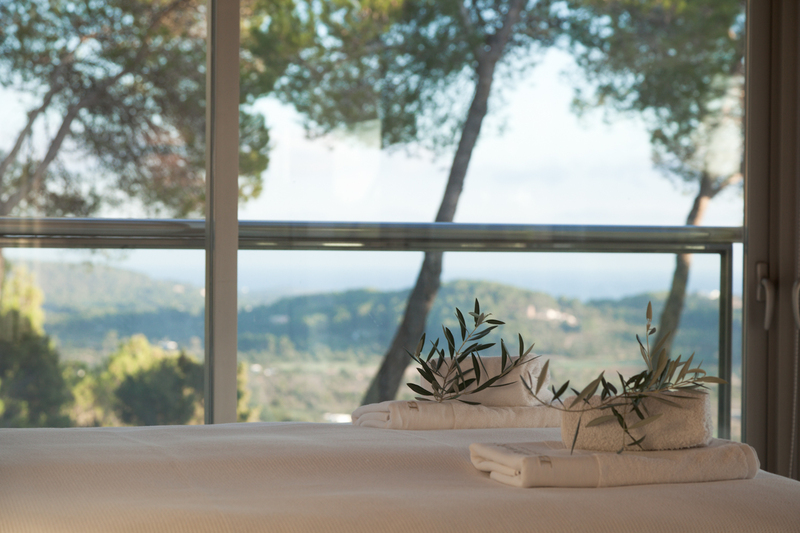 Consisting of a pine tree forest, the terrain also offers views across agricultural land. 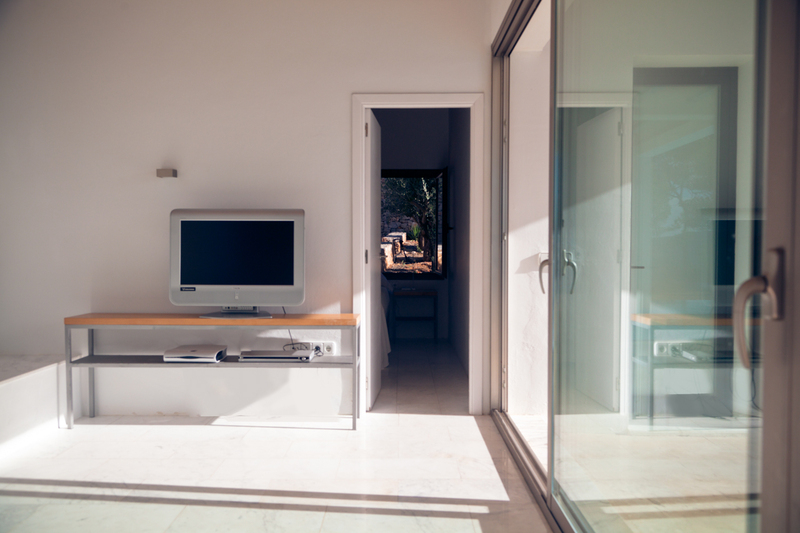 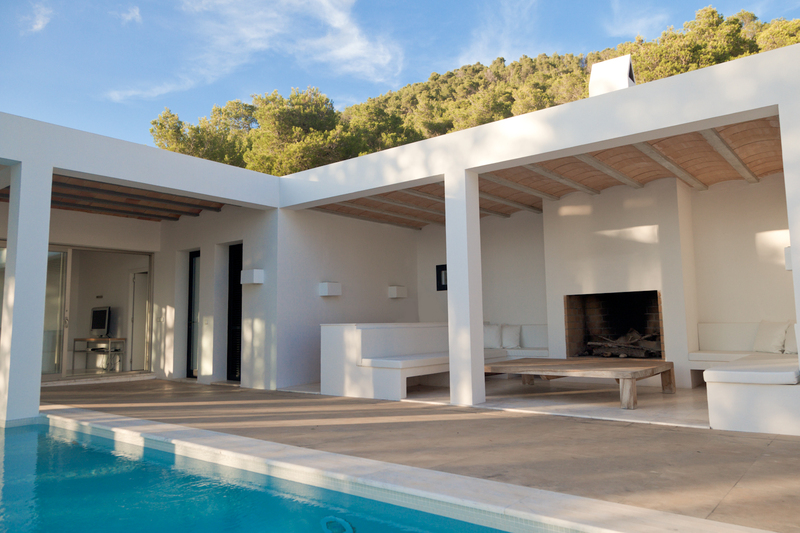 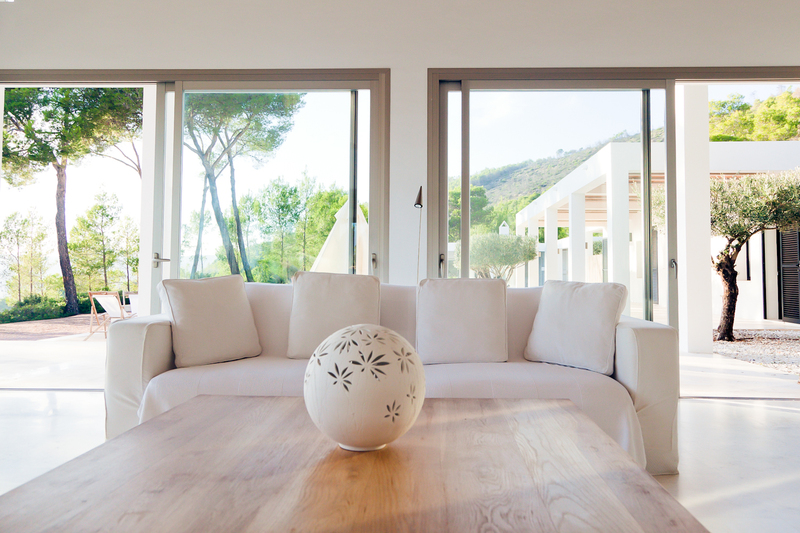 A stunning luxury Ibiza villa with minimalist architecture, yet built in a local traditional style. 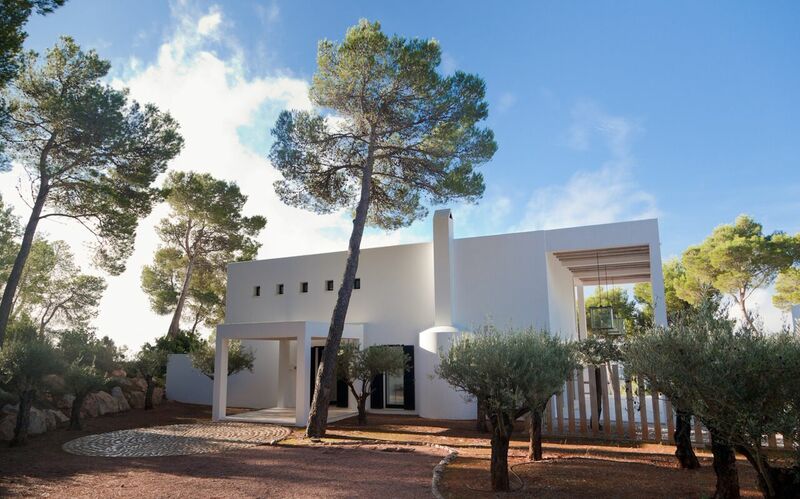 Designed by the renowned Irish architect, John Meagher, the property is carefully constructed to reflect the Ibicencan architecture of a traditional finca, yet finished in a classic, clean, contemporary style. 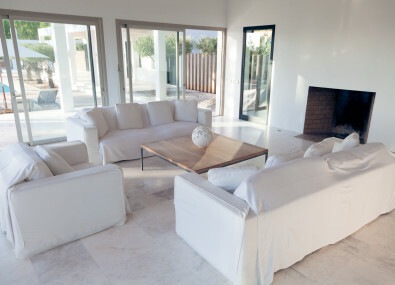 The villa consists a double-height living room with a large statement fireplace and a gallery that overlooks the sitting room and swimming pool from the master suite upstairs. 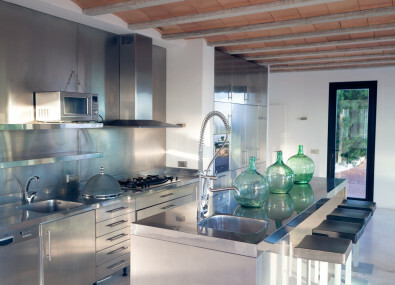 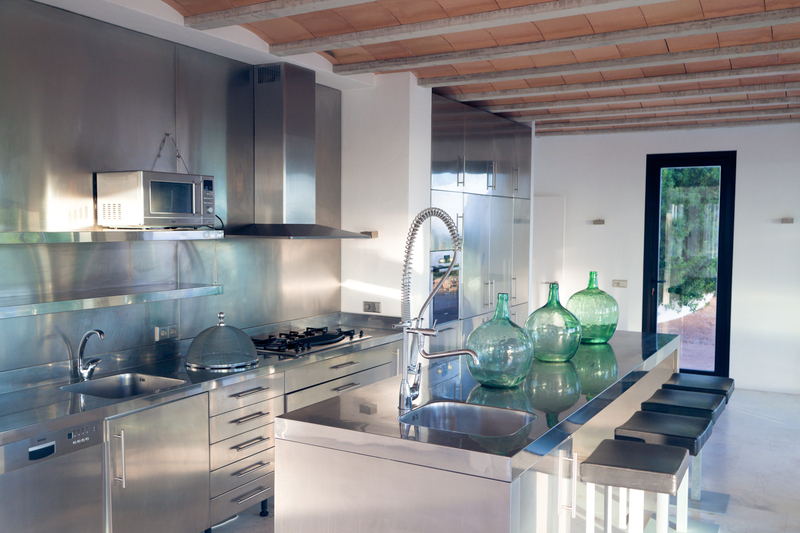 A state-of-the art fully equipped kitchen, follows the architect’s desire for a classic yet minimalistic style luxury Ibiza villa. 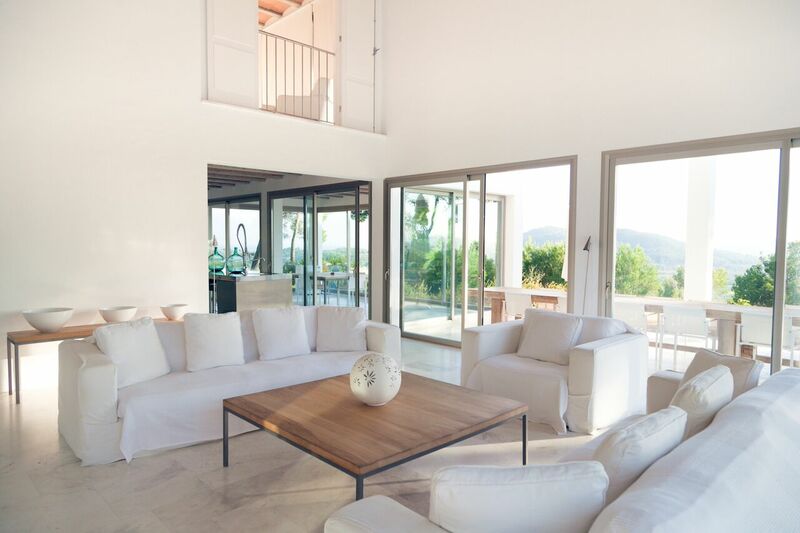 Spacious and light throughout, Villa Leoni Arriba has six bedrooms and six bathrooms. 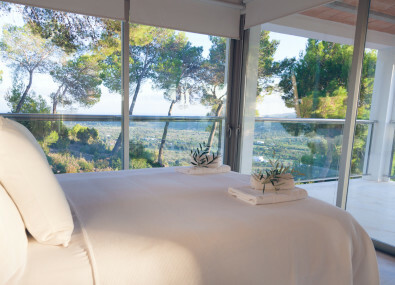 The master bedroom suite on the first floor has a private terrace offering beautiful views. 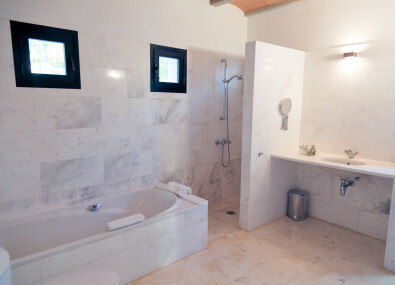 Adjacent to the master is an additional single bedroom which shares the master’s en-suite bathroom. 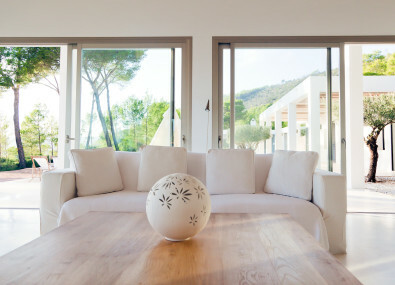 This bedroom is perfect for a child or nanny. 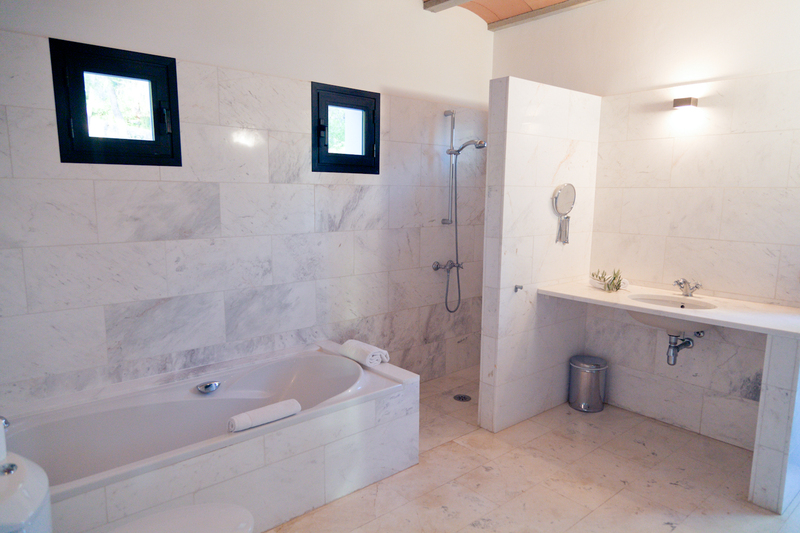 The master suite has an en-suite bathroom, together with a private outdoor shower. 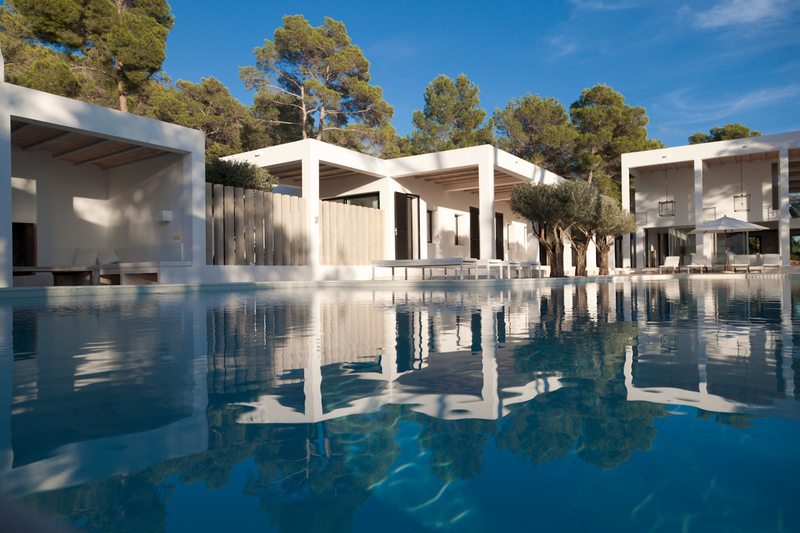 Located along the swimming pool, five further bedrooms all with en-suite bathrooms, as well as having private alfresco showers. 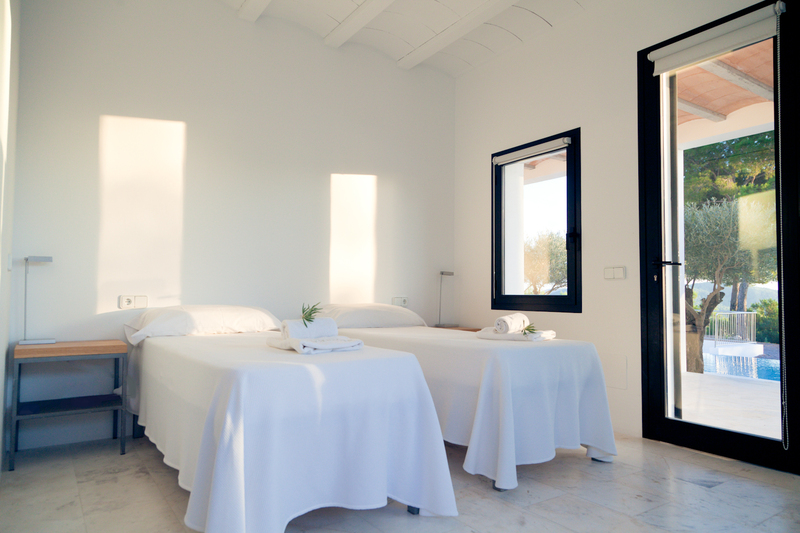 It is possible to make these bedrooms as twins or doubles to suit the party. 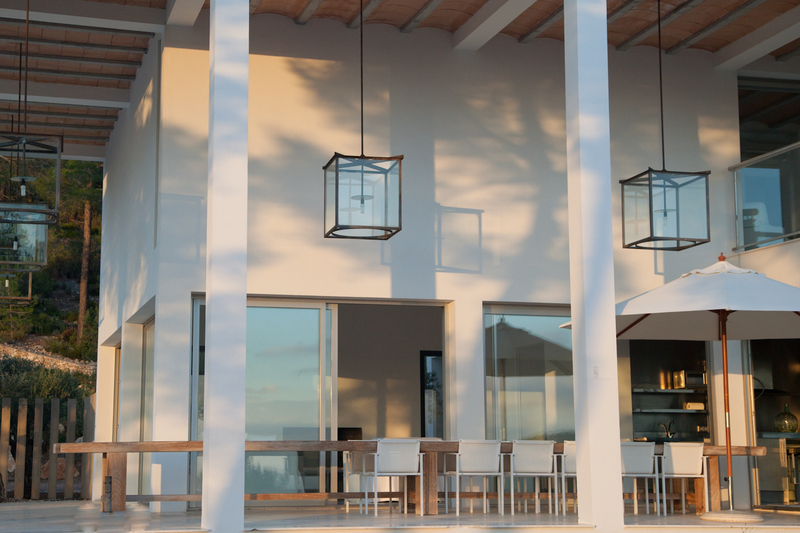 Outside there is a large high ceiling terrace with statement glass lanterns design by the architect and produced locally. 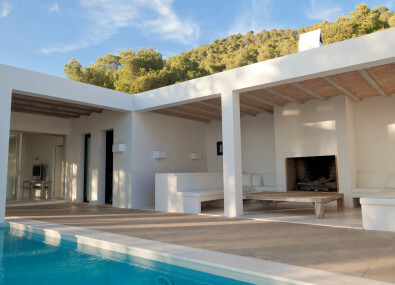 In local style, the roof features exposed beams and terracotta shells. 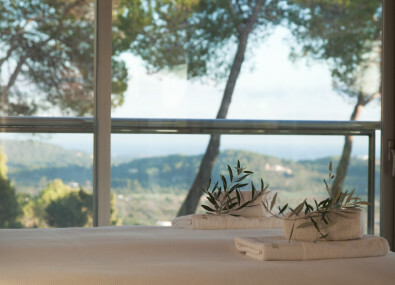 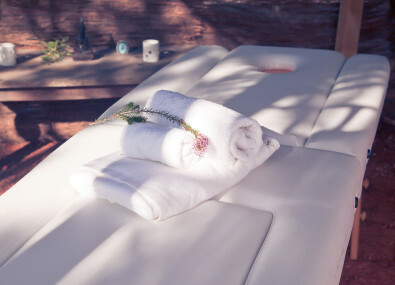 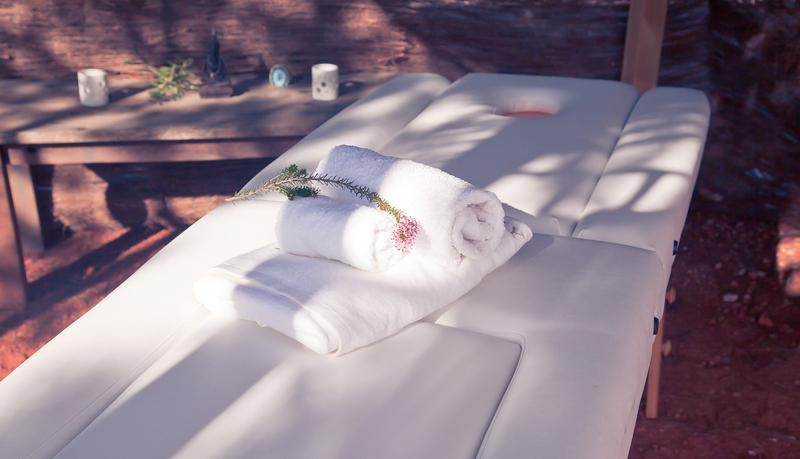 Perched in between the shrubbery at the front of the house is the wooden yoga deck offering beautiful panoramic views. 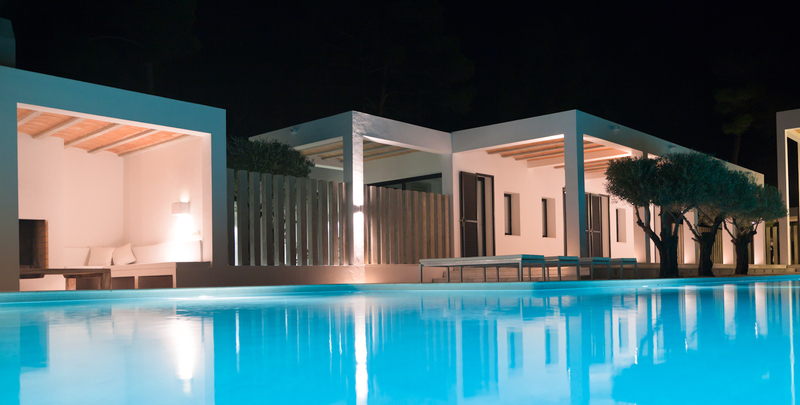 Lights in the colonnade outside the double-height living room are reflected in the swimming pool at sunset. 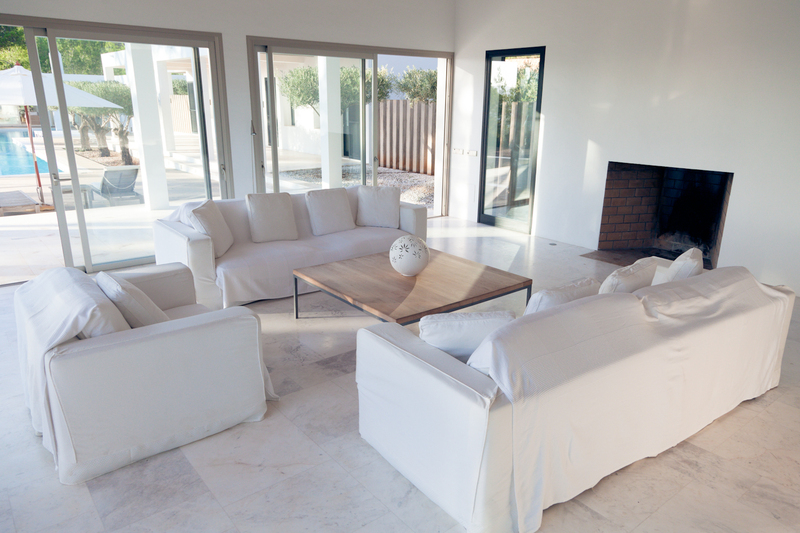 Opposite the swimming pool is a lovely chill out space with outdoor kitchen and also a fireplace. 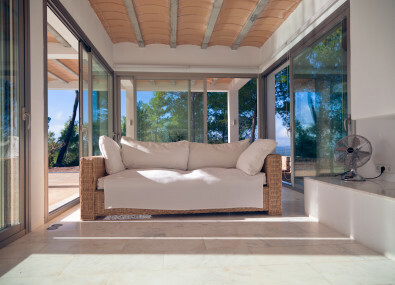 Features include mains electricity, own well and cistern, telephone, satellite TV, WiFi, gardens, yoga deck, electric gate, private parking, private 25m swimming pool, air conditioning, two chimneys, central heating, covered terraces, various alfresco seating areas and separate laundry room. 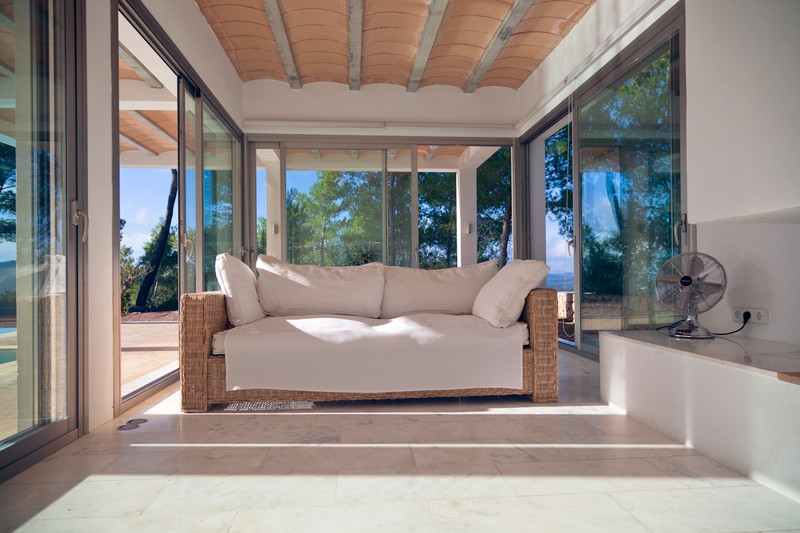 All in all, this property fits into the beautiful landscape and gives a complete feeling of Zen and tranquility. 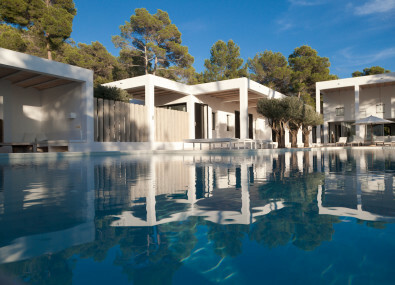 Located on the same hillside is a second villa, designed by the same architect. 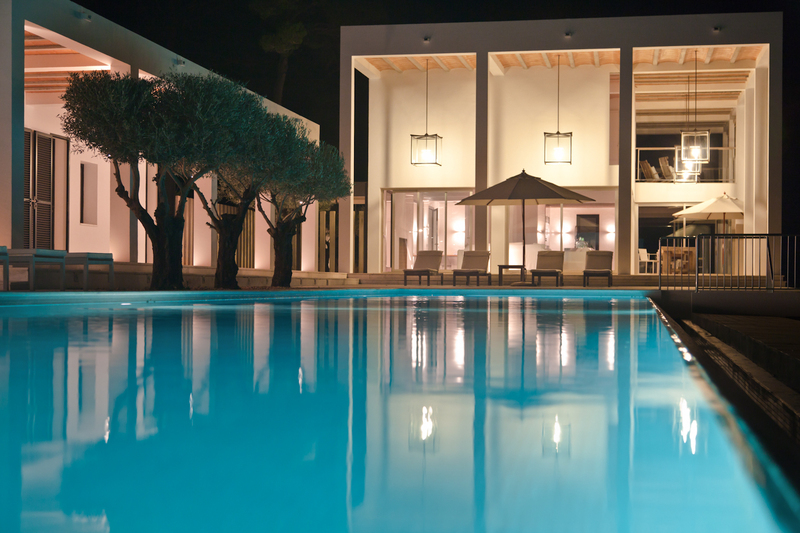 Rented together with Villa Leoni Abajo, they are perfect for larger groups, retreats and weddings. 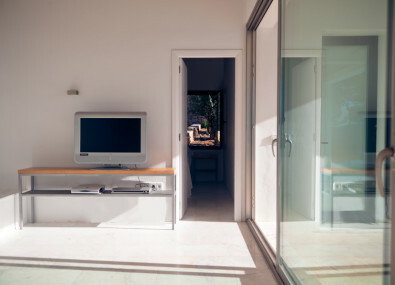 Both completely independent and separate from each other, offering complete privacy. 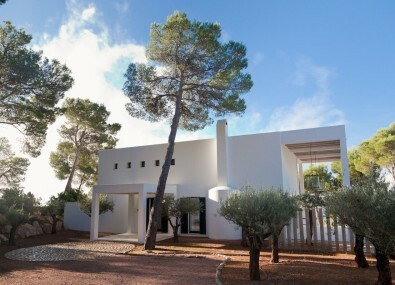 The architect designed both properties so they are almost identical, both in style and size.